Depending on the number of clients the day spa serves, many day spas will choose to use a steam generator instead of a steam boiler, as their steam showers or steam rooms tend to be smaller with intermittent use. The AX steam generator with A6 control allows the day spa attendants to manage the steam bathing experience for the clients by changing the temperature, lighting, and even introducing aromatherapy either by using the A6 control or the paired amerecConnect app for mobile devices and PCs. invitation to comfort. An AK generator uses full power to quickly heat up the steam room to its preset temperature, then cuts power by 1/3 or 2/3 of its heating elements. The result is a more consistent flow of soft steam and more stable temperature – the perfect conditions for relaxing and recharging whenever the mood strikes you. We have designed our AX series generators for long lasting performance and reliability. 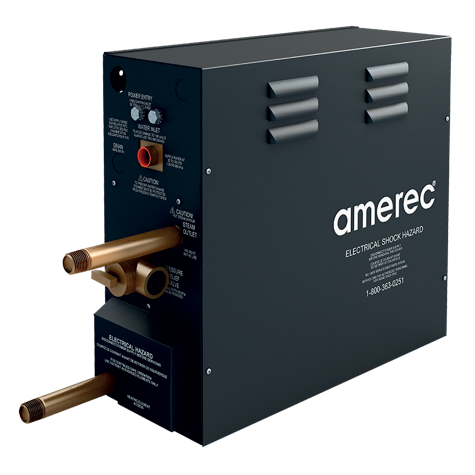 Consistent and even flow of steam are unique Amerec features that set our generators apart. For a truly first class steam bath experience, integrate it with your existing smart home solution. Watch these videos to learn more about the A6 Control. Sequential Temperature Control delivers a more consistent flow of Soft experience. 4 sizes handle a range of steam bath sizes up to 550 cubic feet. AK generators can be connected together to heat steam baths larger than 550 cubic feet. For day spas which prefer simple controls, the AK with K60 Control is a great solution. The K60 Control provides adjustable timer (up to 60 minutes) and temperature with a digital display and on/off button. With fewer features to the control, it is easy to allow customers to adjust their own temperature for the steam room. The AK generator produces the same high-quality steam experience with consistent heat & steam, like the AX.